MegaSquirt-II is a plug-in processor card which has the MC9S12C64 processor plus support hardware as well as a stepper motor chip. MegaSquirt-II™ is a daughter card that replaces the 68HC908 (MegaSquirt-I™) processor in MegaSquirt®. The end of MegaSquirt-II™ daughter card with the row of three jumpers on it (JP1) goes towards the notched end of the MegaSquirt® CPU socket. Note that if you install it the wrong way around, it will hit the case (or overhang the MegaSquirt® PCB, if it isn't in a case yet). Physically install the MegaSquirt-II into the 40 pin socket. The 3x2 BDM header pins signify the end of MS-II that should be oriented nearest the edge of the main board where the copyright notice is (i.e. away from the heat sink on a V3 board). The pins on the MegaSquirt-II daughter board are very stiff. If they should become bent (in shipping for example), it is best to straighten them with a needle-nose pliers rather than try to bend by hand - they are stiff enough that you could end up snapping one off. From a MegaSquirt-II partial kit: The assembly instructions for the partial kit are at V2.2/V3. Wherever the assembly instructions call for the processor to be installed, you install the MegaSquirt-II daughter card in the 40 pin DIP socket instead (paying careful attention to orientation). If the jumper is only on 1 header pin, then you also have the operating program loaded, and if you plug in to a main board with a stimulator you should see the injector lights flashing, meaning the program is running. In most cases the jumper will be over both pins. This means only the bootloader program is loaded and you must load the operating program using Eric Fahlgren's downloader program. Place MegaSquirt-II™ into the 40 pin socket. Be sure the bootloader jumper is in place. Power up your MegaSquirt® controller. Click here to download the MS-II Code Update Utility (aka. the 'downloader'). 'Run' the file, and follow the directions that come up. This will install the downloader. To load a 'ready to load' .S19 file to your MegaSquirt-II over the serial port, you need to use Eric Fahlgren's MegaSquirt-II downloader program (click the link to download), which works from either a window or from the command line. Next you may need to connect some jumpers. to pin #16 on the 40 pin DIP (i.e., JP1-#6 on the MegaSquirt® PCB). On a V3 main board, follow the instructions in the V3 assembly guide. This is the one non-plug-n-play setup between the 68HC908GP32 processor (i.e., the MegaSquirt® processor) and the MegaSquirt-II board. The problem is that the MegaSquirt-II needs the +12V, but there is nothing like this running to the DIP40 socket for the 68HC908GP32 (for obvious reasons: 12 Volts would cook the GP32). Use a 40 pin socket and snip pin #16 off the socket. That way you can easily switch between MS-I and MS-II and not have to bend/snip the pin on the actual processor. Also, if you are going back to MegaSquirt-I be sure to unplug your stepper motor if you had one connected, because it will confuse and possibly damage your MegaSquirt-I if you don't. It will run for a while and then start resetting madly. This is in addition to the fact that you must unplug the 12V line from the socket before re-installing MegaSquirt-I. Then you have real plug 'n play between the MegaSquirt-II™ and the 68HC908GP32 from MegaSquirt-I. This is one of the issues Bruce is addressing on the new V3.000 printed circuit board with a pad on pin 16 and a sanctioned +12V source pad. To use the ignition control and IAC control functions of MegaSquirt-II™ on a V2.2 MegaSquirt® PCB, you will need to add wires for these functions, and set a jumper or two. The ignition control wire should be hooked to the 5th pin on the JP1 header (the row of closely spaced holes beside the CPU socket, near the copyright notice). The IAC pins are connected to X2, X3, X4, and X5 (see the illustration below). To bring the connections out on the DB37 connector, you will need to add a few jumper wires. 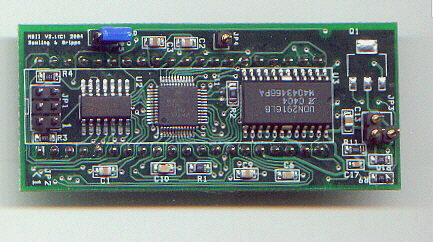 Note that the V3 main board has dedicated jumpers for the IAC, see the instruction in step #22 of the V3 assembly guide. Then you need to select the 'Idle Control/Algorithm' in MegaTune. In some cases setting the stepper motor to "IAC Stepper Always On" will cause the IAC to get hot. However setting it to "IAC Stepper Moving Only", might cause a problem with idle speed changing from one start to another. You can test if your IAC is suitable for 'always on' by leaving your stepper powered on the bench for 15 min or so. If it doesn't feel too hot to you, then set it to "Always On". Apparently this is what GM does. But if you want to be safe they should test it on the bench for 15 min or so, or monitor it closely in the car while not moving for at least 15 minutes, checking the IAC temperature frequently with your fingers. It may get warm, but it shouldn't burn your fingers just touching it. There are more details on the IAC page. (These DB37 pins are also used for V3.0 main boards). If you are not using a FIdle valve (using an IAC for example), you can remove Q5 from the V2.2 MegaSquirt® PCB, and connect a jumper from JP1-5 to the hole for Q5 closest to R29 (i.e., towards the 'bottom' of the board, if you have the silk screen writing the correct way around). This will give you an ignition control signal on the DB37 pin #30. If you are using the ignition control, but not the IAC, you can connect the ignition control wire to any of the X11 to X14 holes, and retain your FIdle function. For example, on the GM 7-pin HEI module, you connect the MegaSquirt-II signal to the ignitions module's pin "E". You will also need to wire other connections to your ignition module, depending on its make/model. Here are more ignition details. Note that the ignition signal comes in to MegaSquirt-II on DB37 pin #24, as with the standard MegaSquirt. MegaSquirt needed one signal per ignition event, but the timing was not critical. MegaSquirt-II needs one signal per ignition event, but this signal MUST occur at the advance offset with respect to TDC. So you CANNOT use the negative side of the coil to trigger MegaSquirt-II because the coil already has timing advance built in, and using it for a timing signal will screw up the total advance severely. You must use the appropriate distributor or crank wheel for your ignition module. One other thing to note is that the "Dave" cap will delay incoming ignition pulses. The delay is dependent on frequency. It should be used only if people are tapping an ignition coil primary for fuel-only. For any type of ignition control installation, the input source should be Hall or VR sensor or something else other than the coil primary windings (i.e., the (-) terminal of the coil). So, for these cases, the Dave cap should be eliminated or drastically reduced, or there may be an rpm dependent delay in timing. JP5 - Bootloader SPDT switch for load code to MegaSquirt-II. Set the coil charging scheme to 'Going High (Inverted)' in TunerStudioMS - this ensures that the coil is grounded (charging) during the dwell period, and that the spark occurs at the correct time. See: www.megamanual.com/ms2/vb921.htm for more information. MegaSquirt-II™ has the provisions for a second independent 'real time' baro sensor. This will update your fueling continuously, which may be helpful if you are climbing the Rocky mountains or running Pike's Peak. sensor pin #3 to 5 Volts - use the via at the "M" in the copyright notice near the existing MAP sensor on a V2.2 board, use the sanctioned 5V supply in the proto area on a V3 main board. sensor pin #3 to 5 Volts - use one of the three S5 sanctioned 5V jumper locations. You can use other 0-5 volt pressure sensors, but you will have to calibrate it using the 'Tools/Sensor Calibration' dialog in MegaTune. You can test your installed MegaSquirt-II™ with the regular stimulator. With the stim, you should see the INJ1 and INJ2 LEDs flash, with the frequency dependent on the setting of the rpm pots. The fuel pump LED should come on and stay on, however the FIdle LED will not come on unless you have chosen the FIdle option in the tuning software. If you want the stim to display the output of the IGBT circuit, you can modify your stim with a 330 Ohm resistor, LED, and a bit of jumper wire. The LED will flash at every ignition event, though this can be hard to see at all but very low rpms (~400 rpm with a V8). Solder each side of the lead that passes through the PCB, this will hold it in place. The resistor lead can simply be clamped into the + terminal block on one side, and soldered to the long lead on the other end. This circuit is especially useful to ensure that your coil is not charging (LED not lit) when rpm drop very low. This prevents the coil from burning up when the ignition key is 'on' but the engine isn't started (when editing parameters in MegaTune for example). Alternatively, you can wire a stop lamp bulb in place of the coil while setting up, and ensure that it is NOT light while the rpms are zero and the ignition is switched to the 'on' position. If you have questions, there is a huge amount of collective experience and knowledge related to the assembly and installation of MegaSquirt®/MegaSquirt-II™ in various vehicles available on the MegaSquirt forums. For the second ignition driver, you would have to duplicate the second circuit on MicroSquirt® (with a VB921 (or BIP373), and a 100 Ohm, and 100K Ohm resistors), connected to the microcontroller's PT4 port (CPU pin #7), which is currently used for PWM2 (pin #4 on the MC74HC00M), and would have to be brought off MS-II separately with a jumper wire. (See: www.microsquirt.info/us_hardware.htm). You will want to jumper from the MC74HC00D, as the spacing is very tight on the CPU pins. Pin #1 on the MC74HC00M is nearest the "1" for the 3x2 BDM jumper, and you count the pins counter-clockwise around the IC. This same pin routing is made on the MS-II daughter board by disabling the PWM traces into the logic chip and routing them to the appropriate output connector pins. The same software will then work in the same way on MS-II and MicroSquirt. It's not a difficult job for someone experienced in this, and would only take a few minutes to do. But it's not something you want to try without practice and the proper soldering iron and solder. If you don't make the mod to MS-II, then do NOT set any of the Dual Spark options - they will not work. But you can use the v2.83+ code with the unmodified MS-II board to get all the other features of this code. The MM74HC00 NAND gate needs to stay in place on MS-II, but with some mods. Pad #4 is for the second ignition output channel. Also note that you lose the PWM current limiting, so you must use resistors with low impedance injectors. ©2004, 2011 Al Grippo and Bruce Bowling - All rights reserved. MegaSquirt® and MicroSquirt® are registered trademarks.